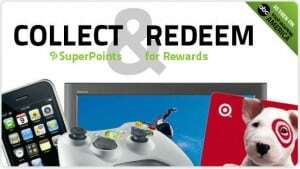 Superpoints | Earn Amazon GCs, Apple iPods, Apple iPads & Cash! Have you joined Superpoints? I did two days ago after I saw the rewards catalog. It’s a rewards program similar to Swagbucks (no toolbar though) where you earn points and can redeem them for prizes. I joined 2 days ago and I’m at 223 points! It’s by invite only and I have some invites left if you want to join and try it out! Just leave me a comment here and I’ll send you one. if you have any left please send me one. thank you for all the help you give! This looks interesting! I would love an invite! heh stacie… if you have any more of the super points I would love one… i can see alot of people have asked… but if you have any , than i’d be really glad to have one. I’ve added you to my blog… hope you don’t mind… i mean your contests (i’ve linked them to my blog… so my members can see your new contests, and come into your blog from mine>…. they still have to come in here, so it works for you////// would love tips if you’d like to share any… blog tips that is. have a lovely day..nadia. Hey Stacie! I really want to register with Superpoints but I need a reference… would you like to give me one, please? I’d appreciate it, I am really trying to build my blog and whatnot. If you can spare an invite, I’d love one. If you have more invite codes for superpoints I would like to use it. Thank you! Could you send me an invite at [email protected]?